Rising Pune Supergiants had been marred by four major injuries in the last two weeks and were reeling at the bottom half of the points table with six losses from eight matches. But against Delhi Daredevils at the Feroz Shah Kotla, they fell back on the reliable shoulders of Ajinkya Rahane, Rajat Bhatia and a brisk innings from IPL debutant Usman Khawaja to hand the hosts their second loss in their last four matches. 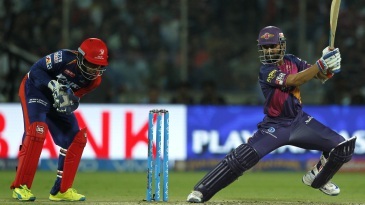 Supergiants first restricted Daredevils to 162 by slowing them down in the middle overs and taking regular wickets. The top order then, led by Rahane's unbeaten and unflustered 63, made sure the chase, which got slightly tense towards the end, was sealed with five balls to spare.